King Vidor, the pulp writer? Now, can this be the famous film director of Fountainhead, Ruby Gentry, War and Peace and other films? Charles Beckman's short story "The Dancing Death"? As many of you probably know, pulp writer Charles Beckman who specialized in hardboiled and noir crime stories and wrote also for the western market has been seeing a revival of his work getting into print. (Here and here Amazon links for the new collections of his old stories.) Beckman is still alive and I was able to ask him via James Reasoner if I could a small collection of his work that's been translated in Finnish. After I'd typed "Class Reunion" I started typing the other story from the 1955 pulp mag. The Finnish title is "Tanssiva kuolema", which translates back as "The Dancing Death". The anti-hero of the story is one "Kippy Nikkeli" (I believe the name's been changed), who's on the run from some organized crime thugs, one of whom is called Pope (probably so, since his name is translated as "Paavi", which is the literal translation of "Pope"). In the beginning of the story Kippy finds himself in a junky joint trying to have a hamburger. It seems he hears voices in his head, and he also reminiscences another joint where he used to dance. He's also involving with Pope's mistress falling in love with another man. It's a moody noir-type piece where there no winners, only losers. Now, there are several problems. Beckman himself didn't remember the story, nor did he find it in the pulp magazines he still has from his writing days. The story is not "Run, Cat, Run" that was reprinted in Beckman's Suspense, Suspicion & Shockers, nor is it "Should a Tear be Shed" in the same book, even though they share some similarities. Googling the story's name with "Charles Beckman" doesn't give any clues. I don't have access to the crime fiction short story indices and I could check only the Fictionmags Index. There are some stories with the title "The Dancing Death", but none that match. Some of the stories listed therein did appear in a pulp magazine, but they seem to be a bit old or too long, i.e. serials. The story that I have at hand is more like a filler, even though it's a good story. But there's a story called "Die Dancing, Kid" from Detective Tales, January 1947, and by Charles Beckman. 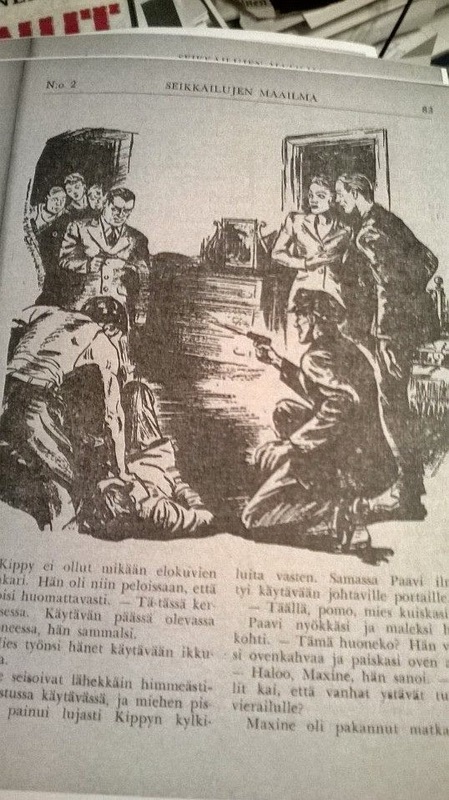 Now, the publisher of Seikkailujen Maailma used lots of stories from the Popular Publications' magazines, such as Dime Detective and Detective Tales (and also Dime Mystery). I asked Beckman again if this could be our story. He said he doesn't remember writing that story and doesn't have a copy. Now, does anyone have the issue of Detective Tales, January 1947, and can check the story out for me? The photo accompanying this post is the illustration for the Finnish publication. For all I know, it could be the original illustration for Beckman's story. This is a very good book: original, well-written and unpredictable, even though at times there are some elements that might be a bit too familiar. That happens in almost any noir novel, though. I can't see how you could get away without adding any tough gangsters or any other clichéd material. At least Pizzolatto does a pretty good job with them. The antihero of the book, Roy Cady is a man without a future. He's doubly that: he's got cancer in his lungs, and he works as a hired hand for a local crime boss who loves Cady's ladyfriend. Cady is a man without qualities, he's empty inside, were it not for the cancer. Even though July and August were supposed to be a vacation, I had to read work-related stuff: I've started doing a book on the history of Finnish western literature. I also reread lots of Tolkien, since I did a non-fiction book on Tolkien with a friend of mine. I finished it up late last week and sent it off. Now I'm finishing some other lesser books, such as a small anthology of western-themed horror stories by Finnish writers. Then I'm rushing off to finish a book on Finnish war-time photography. Then I'll be able to concentrate on my book on Finnish westerns. Sounds like I'll be busy, eh? I'll try to get back to regular blogging, but don't expect much, since I'll be loaded with work. Our son went to a fourth grade and comes back home at two p.m., so the working hours are a bit short. Maybe some Overlooked Movies and Forgotten Books every now then. 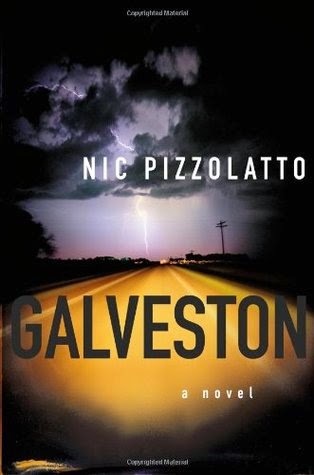 Oh, I started Nic "True Detective" Pizzolatto's novel Galveston and it seems really, really good. I also read Gillian Flynn's Dark Places (came out in Finnish as Paha paikka) and I liked it a great deal. It's almost like a private eye novel in which the protagonist is herself in the middle of the mystery. Every move, every inquiry she makes affects her own life. Highly recommended, even more so than her celebrated Gone Girl.